logos Archives - io design & illustration, inc.
io design & illustration, inc.
On first load, the stars in the header and footer twinkle. How could I not have a great time designing for a business called PLANET ART!?! An illustrated logo with influences from pulp SciFi covers – fun – owners, Brandy and Dave – double fun – getting to also design a rack card, car graphic, t-shirts, event posters and a WordPress site – okay, you get the idea, fun. 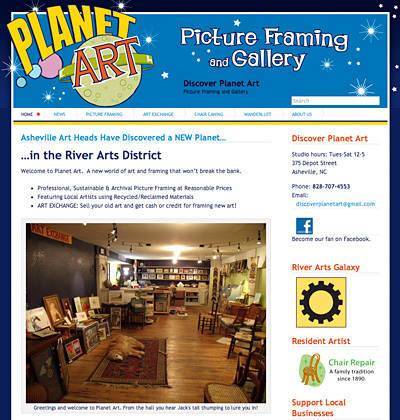 Planet Art is a different kind of frame shop and gallery located in the River Arts Galaxy in Asheville, NC. They have an Art Exchange where you can buy and sell (for cash or store credit) gently used art, a gallery wall to feature local artists, and of course do an excellent job framing. Brandy is one of our star WordPress clients. She dove right in and mucked about with pages and post almost immediately after getting the login for her site. She has used photos well and included lots of relevant info. She has also been savvy about cross-linking to her Chair Repair website and included some of the basics on chair caning on the Planet Art site. We touch base with her every few months to see if questions have come up, and to tweak css here and there as needed and to add items to the sidebar which requires some html knowledge. My bet is she’ll soon master that as well. Why Use Rich Black Ink Mix? © 2019 All content and images on this site copyright io design & illustration, inc. All rights reserved. In other words, don't steal the images from this site. It is not only unethical, it is illegal and our clients will be most unhappy to see their images in unexpected places. If you are interested in an image, ask. Powered by Wordpress on solar powered servers.